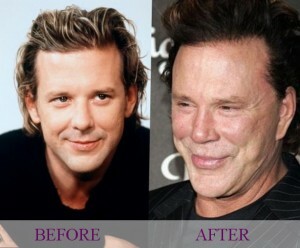 Plastic surgery helps to change face features, body forms and hide age well. But unfortunately not always we receive an expected outcome. Unsuccessful result frequently depends on many factors such as inexperienced surgeon, individual constitutional peculiarities or the infection may appear. So let’s give consideration to the consequences of such surgical intervention. 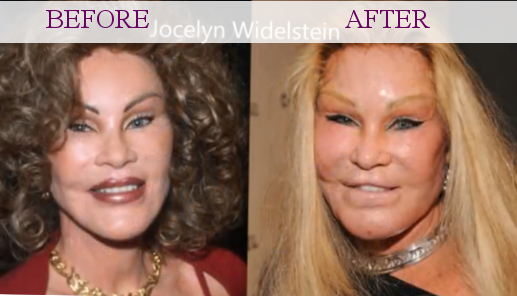 Number one is Jocelyn Wildenstein. 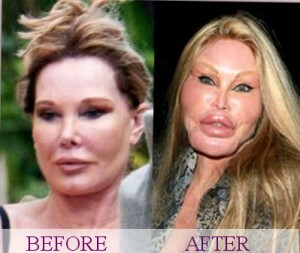 This woman spent more than 4 million dollars on plastic operations. You may wonder what for did she do it? Her goal was at least strange. She wanted to look like a cat, because such resemblance was necessary to her husband, who liked cats. She had cheek implants, numerous facelifts and eyelifts but all her efforts were useless because as a result her husband left her. Number two in our list is Donatella Versace. The inheritress of her brother came into an inheritance of the global brand in 1997. The new status Donatella marked by her first plastic surgery. Firstly she changed her lips. From all appearances she liked such changes so much that continued experiments with the other parts of her body. Nose correction, botox injections, breast-enlarging surgery and this is not the full list of her operations. Frankly speaking no one exactly knows how many times she was undergone surgical interventions. The facts are obvious, Donatella’s transformations are considered to be the symbol of unsuccessful plastic surgery. 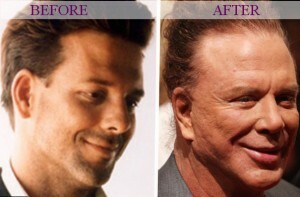 Hereafter is Mickey Rourke. In one moment the actor was seriously going in for sport because he thought that he would never come back to Hollywood. Nevertheless after the latest injury he decided to film again. But he had nose fracture, hand fracture and some other injuries. So he was made to use plastic surgery in order to improve the situation. 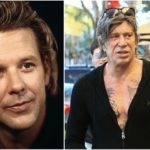 He had five operations on his nose, facelifting, blepharoplasty and unfortunately the sad result of numerous operations. Pamela Anderson is also an adherent of plastic surgery. Ex teacher and a famous actress is well-known by her experiments with breast-enlarging surgery. She made her fascinating career thanks to her extremal breast size. Also she changed the form of her eyebrows and corrected her chin. Lil Kim, who was one of the first women who played hip-hop music, offended against law. In 2005 she was put behind the bars. 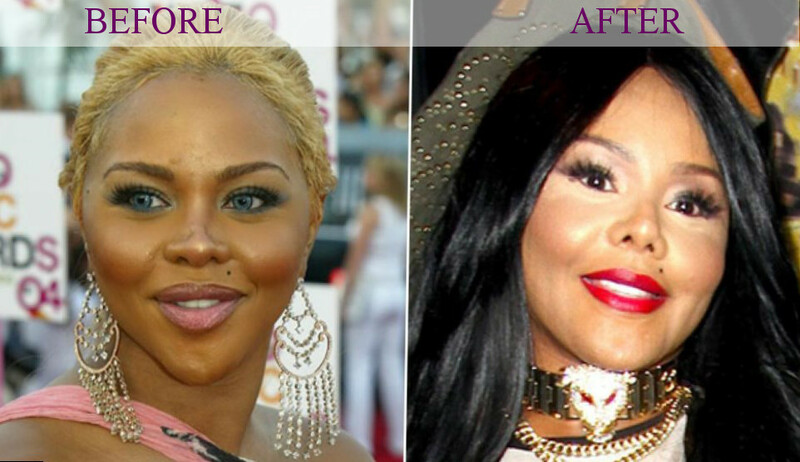 After this the singer went on consultation to plastic surgeon. During seven years she was done more than ten operations and after every operation her face became ugly. Her eyes at first were constricted than vice verse – were expanded. But last year she met a good doctor who made her face more or lace normal. 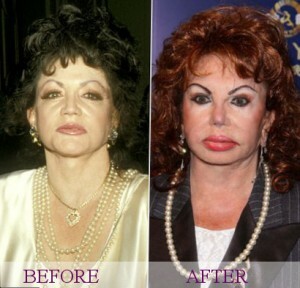 Jackie Stallone is one more victim of plastic surgery. Lip plumping is one of the most popular operations among the celebrities. But Stallonne’s mother didn’t leave it at that. Jackie tried practically almost everything among plastic operations. 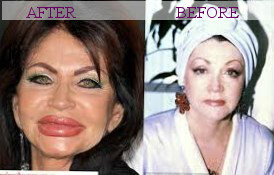 She made facelifting, eyelifting, had cheek implants and changed her nose form. The result of such experiments can be seen on her face!